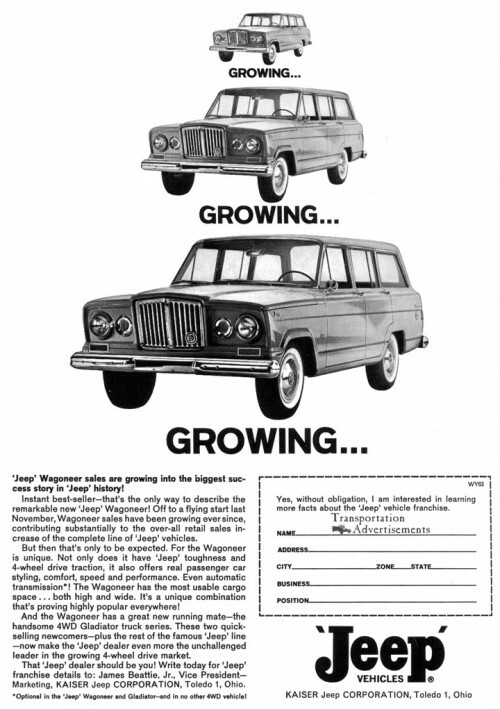 ‘Jeep’ Wagoneer sales are growing into the biggest success story in ‘Jeep” history! Instant best-sellers – that’s the only way to describe the remarkable new ‘Jeep’ Wagoneer! Off to a flying start last November, Wagoneer sales have been growing ever since, contributing substantially to the over-all retail sales increase of the complete line of ‘Jeep’ vehicles. But then that’s only to be expected. For the Wagoneer is unique. Not only does it have ‘jeep” toughness and 4-wheel drive traction, it also offers real passenger car styling, comfort, speed and performance. Even automatic transmission*! The Wagoneer has the most usable cargo space… both high and wide. It’s a unique combination that’s proving popular everywhere! And the Wagoneer has a great new running mate- the handsome 4WD Gladiator truck series. These two quick-selling newcomers – plus the rest of the famous ‘Jeep’ line – now make the ‘Jeep’ dealer even more the unchallenged leader in the growing 4-wheel drive market. That ‘Jeep’ dealer could be you! Write today for ‘Jeep” franchise details to: James Beattie, Jr. Vice President – Marketing, KAISER Jeep CORPORATION, Toledo 1, Ohio. *Optional in the ‘Jeep’ Wagoneer and Gladiator – and in no other 4WD vehicle! Transportation Advertisements is powered by	WordPress 5.0.4 and delivered to you in 0.350 seconds using 29 queries.